At least 270,000 Syrians more than the population of Orlando, Florida — have fled their homes in southwest Syria since the government launched an offensive against rebels more than two weeks ago, according to the UN Refugee Agency (UNHCR). Around 6.2 million Syrians have been displaced since the conflict began in 2011 — and a further 6.3 million have fled the country as refugees, according to a recent UNHCR report. Negotiations for an immediate ceasefire in southern Syria are ongoing, Jordan’s Minister for Media Affairs and Communications, Jumana Ghunaimat, confirmed on Monday. 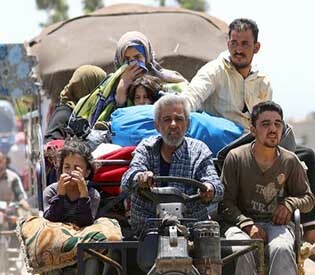 “Daraa residents are effectively trapped — many of those who are displaced are living in makeshift tents in the searing heat with insufficient food, water or medical care, and with the constant fear of being exposed to attacks at any given point. Jordan’s border is their only gateway to safety,” said Lynn Maalouf, Amnesty International’s Middle East Research Director.